18 • ROCK products • March 2019 www.rockproducts.com IN THE KNOW For the quarter, freight-adjusted aver- age sales price for aggregates increased 2 percent versus the prior year's quar- ter, with the growth rate negatively affected by strong shipment growth in relatively lower-priced markets such as Alabama, Arizona and Illinois. Excluding mix impact, aggregates price increased 5 percent versus the prior year's fourth quarter. Throughout 2018, pricing momentum continued to improve as the year-over- year growth rate in average sales price increased each quarter. For the year, freight-adjusted aggregates pricing increased 1.4 percent. On a mix-ad- justed basis, pricing increased 3.5 percent versus the prior year. Positive trends in backlogged project work along with demand visibility, customer confidence and logistics con- straints support continued upward pricing movements in 2019. Fourth quarter same-store unit cost of sales (freight-adjusted) decreased compared to the prior year quarter as fixed cost leverage and other operating efficiencies more than offset a 17 per- cent increase in the unit cost for diesel fuel. For the year, same-store unit cost of sales (freight-adjusted) decreased 2 percent, more than offsetting a 25 per- cent increase in the unit cost for diesel fuel. The company remains focused on compounding improvements in unit margins throughout the cycle through fixed cost leverage, price growth and operating efficiencies. Since the recov- ery began in the second half of 2013, gross profit per ton in aggregates has compounded at an average annual growth rate of 13 percent. Tom Hill, chair- man and chief executive officer, said, "Our fourth quarter results reflect a strong finish to the year. Solid shipment growth, com- pounding price improvements and strong operating efficiencies in our aggregates business contributed to double-digit growth in revenues and operating earnings. Aggregates pricing continued its upward momentum, and unit profit- ability expanded further despite higher costs for diesel fuel. This demonstrates the resiliency of our aggregates-cen- tric business model. Our conversion of incremental aggregates sales into aggregates earnings was strong again in the fourth quarter – contributing to a same-store segment gross profit flow- through rate of 64 percent for the year. "Our aggregates-focused business is well positioned for further gains in our industry-leading unit profitability in aggregates," Hill stated. "Since the recovery began in the second half of 2013, our core operating and sales dis- ciplines have contributed to 13 percent average annual growth in aggregates gross profit per ton. We expect dou- ble-digit earnings growth again in 2019, given the strength of our operational performance and continuing growth in public sector demand. Aggregates pric- ing momentum continues to improve. Mix-adjusted pricing in the fourth quar- ter increased 5 percent, and we expect price growth in 2019 at a similar rate. "In our key markets across the United States, we are benefitting dispropor- tionally from both strong growth in public construction demand and con- tinued solid growth in private demand," Hill concluded. 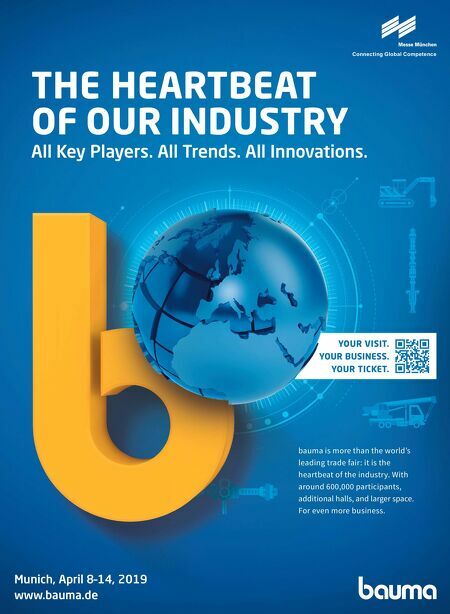 "For 2019, we expect reported earnings from continuing operations of between $4.55 and $5.05 per diluted share and Adjusted EBITDA of between $1.250 and $1.330 billion." Martin Marietta Materials Inc. reported record results for the fourth quarter and year ended Dec. 31, 2018. The company is reporting total revenues of $1,020,218 for the fourth quarter, and $4,244,265 for the year. Fourth-quarter heritage aggregates pricing improved 2.3 percent and ship- ments declined slightly. Excluding the fourth-quarter 2017 shipments from the company's Forsyth, Ga., quarry that was divested in April 2018, fourth-quar- ter 2018 heritage aggregates volume improved 0.5 percent. Shipments for the Mid-America Group heritage operations increased 1.6 percent, driven by heavy industrial projects in the Mideast Division. These gains were offset by weather-related delays in several large public and private construction projects in the Carolinas. Heritage pricing improved 2.1 percent. Shipments for the Southeast Group her- itage operations, as reported, decreased 3.2 percent; excluding fourth-quar- ter 2017 shipments from the Forsyth, Georgia quarry, these shipments increased 1.9 percent. Weather hin- dered construction activity in Georgia and Florida. Heritage pricing improved 7.4 percent, driven by strong gains in North Georgia and a higher percentage of long-haul shipments.\ West Group shipments declined 1.2 percent, driven by Texas' record Octo- ber rainfall, as well as project delays in Colorado. West Group pricing improved 0.5 percent, reflecting robust pricing in Colorado that was partially offset by product mix in Texas. 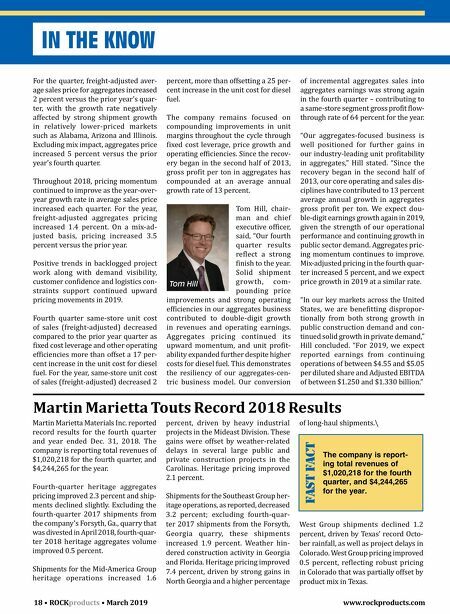 Tom Hill Martin Marietta Touts Record 2018 Results FAST FACT The company is report- ing total revenues of $1,020,218 for the fourth quarter, and $4,244,265 for the year.